Can You Lose Weight With Ocean Spray Cranberry Juice? Ocean Spray Cranberry Juice provides 100 percent of your daily recommended requirement for vitamin C. In addition, cranberry juice has other health benefits and can help you lose weight. Cranberries also contain antioxidants and have been used for centuries as a treatment for urinary tract infections. The combination of Ocean Spray Cranberry Juice, a healthy diet and regular physical activity can help you meet your weight loss goals without feeling tired or hungry. Always check with your doctor before making significant dietary changes. Drink a glass of Ocean Spray Cranberry Juice with a healthy breakfast. One of the most important changes you can make to lose weight is to eat breakfast. Eating breakfast gives you energy to get through the morning with less risk of unhealthy snacking. 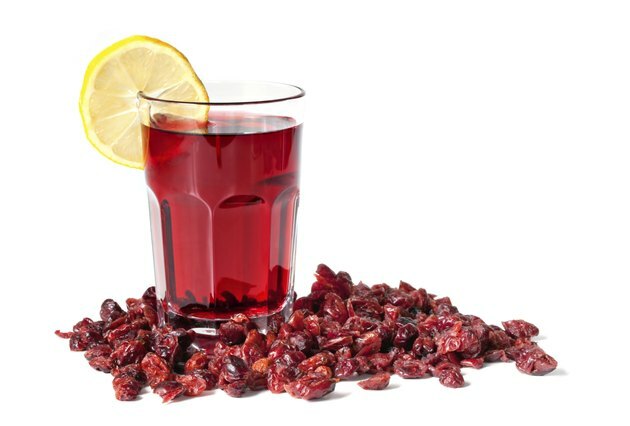 Drinking a glass of cranberry juice with your breakfast also helps fill your stomach so you eat less. Additionally, you're taking steps to prevent dehydration, which can lead to fatigue, headaches and weakness. Make a low-fat fruit smoothie for a snack. In a blender, mix a cup of low-fat yogurt, fresh or frozen berries, a splash of lemon juice and enough Ocean Spray Cranberry Juice to make it smooth. Carry the smoothie with you and have it as a snack during the day, between breakfast and lunch or lunch and dinner. Other than the yogurt, this smoothie contains no fat and has the health benefits and flavor of Ocean Spray Cranberry Juice. As an alternative, you can also freeze Ocean Spray Cranberry Juice in ice cube trays and blend into low-fat yogurt, adding low or non-fat milk to make smoothies. Make a dish of flavored sugar-free gelatin, substituting Ocean Spray Cranberry Juice for the cold water in the recipe. For additional nutrition and fiber, add chopped frozen cherries or strawberries to the mixture before placing in the refrigerator to become firm. Serve with non-fat whipped topping or layer gelatin with the topping in sundae glasses for a delicious, healthy, low sugar and low-fat parfait. Drink an 8-oz. glass filled with one-half Ocean Spray Cranberry Juice and one-half water before every meal. This will ensure that you are meeting your minimum 64 oz. daily requirement for fluid. Drinking a glass of water and Ocean Spray Cranberry Juice will provide vitamin C and antioxidants. MayoClinic.com: Breakfast: Why Is It So Important?